I am still on the hunt for the mean chocolate thief, kind of. In the first part I covered the side of the Raspberry Pi and uploading data to Cloudant. 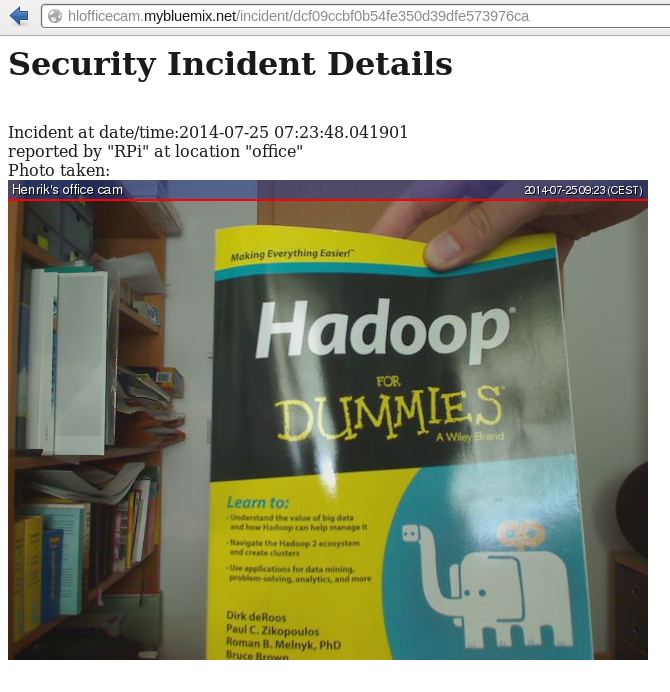 I showed how to set up an infrared motion sensor and a webcam with the RPi, capture a snapshot and secure the image and related metadata in a Cloudant database on the IBM Bluemix Platform-as-a-service (PaaS) offering. In this part I am going to create a small reporting website with Python, hosted as a IBM Bluemix service. The setup phase includes reading in access data for the Cloudant database server. Either that information is taken from a Bluemix environment variable or provided in a file "cloudant.json" (similar to what I did on the RPi). The main part of the script defines three routes, i.e., how to react to certain URL requests. 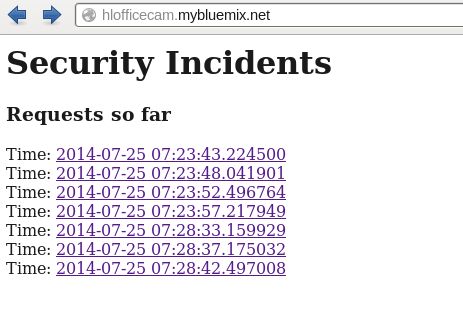 The index page (index()) returns an overview of all recorded incidents, an incident detail page (incident(id)) fetches the data for a single event and embeds the stored webcam image into the generated page, and the last route (image(id)) redirects the request to Cloudant. Looking at how the index page is generated, you will notice that a predefined Cloudant view (secondary index) named "incidents/incidents" is evaluated. It is a simple reduce function that sorts based on the timestamp and document ID and returns just that composite key. Then I access the timestamp information and generate the list as shown in the screenshot above. The incident detail page has the document ID as parameter. This makes it simple to retrieve the entire document and print the details. The webcam image is embedded. So who got my chocolate? Take a look. It looks like someone who got a free copy of "Hadoop for Dummies" at the IDUG North America conference. Maybe another incident will shed light into this mystery. 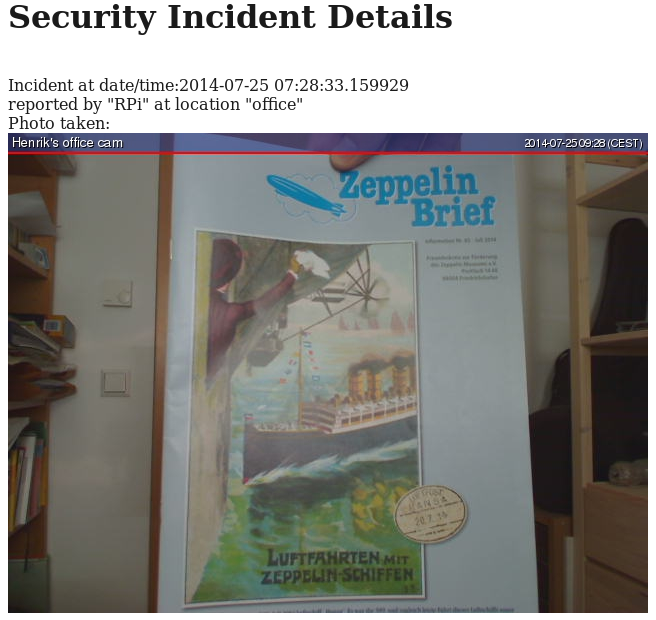 Hmm, looks like someone associated to the "Freundeskreis zur Förderung des Zeppelin Museums e.V." in Friedrichshafen. I showed the pictures to my wife and she was pretty sure who took some chocolate. I should pay more attention when grabbing another piece of my chocolate and should more closely watch how much I am eating/enjoying. Have a nice weekend (and remember to sign up for a free Bluemix account)! DB2 Quiz: Which tool provides this output?